2 days & 1 night at Halong Bay starts from 183$ | only 91.5$ per day - per person All Incl: Private Cabin + Guide + Meals + Fees + Kayaking + Tai Chi Session & more... Friends Travel Vietnam’s - premium selected cruise trips combine the meaningful small-group travel experiences we’ve made famous with a little more polish. Start cruising and enjoy the romantic waves of Halong Bay with Amira cruise. Explore & overnight in your own private cozy luxury cabin with a fascinating and breathtaking peaceful view on this unique UNESCO World Heritage Site, surrounded with thousands of limestone karsts and isles in various shapes and sizes. We know our stuff over the years and we don’t mince our words. And if a cruise in Halong Bay isn’t up to scratch you won’t find it on our selections list, you're just going to have to join us & enjoy! Are you ready for a unique & unforgettable experience and memories you will treasure forever? OUR PRICING High Season period: from 01/01/2018 till 30/04/2018 and from 01/10/2018 till 31/12/2018 Cruise Cabin Cabin setup Cabin price Price for Price per pax - Amira Suite Double/twin bed 418 $USD 2 pax 196 $USD - Amira Suite Single Single bed 319 $USD 1 pax 286 $USD - Amira SuiteTriple Double/twin bed + Extra bed 585 $USD 3 pax 189 $USD - Family Suite Double/twin bed 418 $USD 2 pax 196 $USD - Family Suite Single Single bed 319 $USD 1 pax 286 $USD - Family SuiteTriple Double/twin bed + Extra bed 597 $USD 3 pax 189 $USD - Family Suite 04 pax Double/twin bed 338 $USD 2 pax 170 $USD Low Season period: from 01/05/2018 till 30/09/2018 Cruise Cabin Cabin setup Cabin price Price for Price per pax - Amira Suite Double/twin bed 398 $USD 2 pax 183 $USD - Amira Suite Single Single bed 299 $USD 1 pax 270 $USD - Amira SuiteTriple Double/twin bed + Extra bed 567 $USD 3 pax 178 $USD - Family Suite Double/twin bed 398 $USD 2 pax 183 $USD - Family Suite Single Single bed 299 $USD 1 pax 270 $USD - Family Suite Triple Double/twin bed + Extra bed 567 $USD 3 pax 178 $USD - Family Suite 04 pax Double/twin bed 338 $USD 2 pax 160 $USD * As we would like to surprise you about our quality & services all our tour prices are included as mentioned in our itinerary. Our pricing is only applicable as individual or group bookings as mentioned in our price table, in general you only need some pocket money for your personal expenses as for your drinks. CHECK OUR LATEST PROMOTIONS & OFFERS: Last Minute Deals | Happy Birthday Discounts | Promotions Friends Travel Vietnam offer discounts for groups of 4 or more, we encourage groups to book with us by offering discounts for group bookings. For detailed information for bigger groups, prices and tickets, please contact us! FRIENDS TRAVEL VIETNAM’S LOUNGE WAITING AREA & SERVICES As special privilege for our clients Friends Travel Vietnam has his own private Lounge waiting area at our Office in Hanoi, just for your convenience to relax or to get refreshed. Free services: Breakfast service, drinks, shower service, internet, computer & print service, lounge coaches/beds, secure lugage storage room, Hanoi City map, trekking shoes & gear Extra Services: Laundry service. AIRPORT PICK UP & DROP OFF SERVICE Friends Travel Vietnam offers wide range of transportation services for all over Vietnam especially car rental service with private driver & Airport Transfer Services. We specially take care from your moment of arrival until leaving. We pay attention to detail & understand your expectation. We do not simply provide transportation services, we aim to be your travelling companion. More info or book directly airport transportation click here... IMPORTANT TO KNOW ABOUT HALONG BAY BEFORE YOU BOOK WITH US Please note that Friends Travel Vietnam, tries at all time to give an accurate illustration of the proposed itinerary for 2 days & 1 night on Halong Bay. This is our strenght to be open and honest and to be clear in information to our clients with our reputation during the time we operate, you are traveling to most popular touristic destination in Vietnam. Our intensions are not to create over expectation of your trip, that’s why we would like to share joining a trip like this give you a great experience and a caught a glimpse of breathtaking Halong Bay. But we would like to highlight that Halong Bay will be popular touristic destination as doing the activities and visiting the caves or islands during day 1 and 2, if your schedule allow we advise you to join the option for 3 days & 2 nights on Halong Bay this all for a more better holiday experience, where on the 2nd day you will discover Halong Bay on a non-less-touristic way on a smaller cruise around, to incorporate experience from past travellers' comments and our own research. We just want you in the right mindset before booking & visiting breathtaking Halong Bay. CANCELATION POLICY FOR HALONG BAY CRUISE BOOKINGS - More than 30 days prior to check-in: free of charge - From 30 to 7 days prior to check-in: 10% of total rates - From 6 to 3 days prior to check in: 50% of total rates. - Less than 3 days prior to check-in: 100% of total rates. - No-Show: 100% of total rates. Cancellation notice must be send to us via email. Refunds will be processed in between 48 hours or directly at our office during openings hours. CANCELLATION DECISION MADE BY MANAGEMENT BOARD OF HALONG BAY When cancellation decision are made by Management Board of Halong Bay on the day of the trip in case of bad weather conditions or other safety matters. In such case, we will make alternative travel arrangement for you on request or offer refund in accordance with the cruise policy on the non joined services following your itinerary. Refunds will be processed directly at our office during openings hours. ITINERARY DISCLAIMER This information has been compiled with care and good faith. They give an accurate illustration of the proposed arrangements for this holiday. Occasionally our itineraries are updated during the year to incorporate improvements stemming from past travellers' comments and our own research. The information given in your itinerary may be slightly different on the day of your departure. It's very important that you print and review a final copy of your Itinerary & Trip Notes a couple of days prior to travel, in case there have been changes that affect your plans, we always handover before your departure our latest updated itinerary. If you have any queries, please contact us directly we are here to help you! While we operate successful different options for our “Halong Bay Cruise” trips in this region throughout the year, some changes may occur in our itineraries. Circumstances beyond our control such as changes in local conditions, inclement weather to timetables and transport routes or other reasons could force us to make changes to this itinerary. Any costs shown are subject to change, though are an accurate reflection of costs at time of writing. This can happen with little notice so please be prepared for modifications to the route. The order and timing of included activities in each location may also vary from time to time. Please also note that visa requirements are subject to change and are the responsibility of the traveller and not that of Friends Travel Vietnam. PAYMENT INSTRUCTIONS To secure your booking, you have settled your down-payment with us. The balance due is payable upon your arrival in Hanoi at Friends Travel Vietnam office at 62 Hang Buom street, on the day before your scheduled departure. It’s possible to settle by cash or credit card (settle by card there might be an applicable transaction fee). Be aware that our prices are not inclusive of transfer fees levied by your bank and oversea bank - please ask your bank to transfer the sum prior deduction or any shortfall. The booking is only confirmed when full payment is completed on at least a day before your departure or if agreed others by email. We reserve the right to release part or full booking if the full payment is not completed as deadline. Payment in Vietnam Dong is to be made equivalent to the amount in United States Dollars at the official exchange rate of the VietcomBank at the time of your booking. TRIP NOTES We recommend that you take a moment to read through this information before travelling, and would appreciate any feedback on how well it's being implemented in the field. 2 days & 1 night at Halong Bay starts from 138$ | only 69$ per day - per person All Incl: Private Cabin + Guide + Meals + Fees + Kayaking + Tai Chi Session & more... Friends Travel Vietnam’s - premium selected cruise trips combine the meaningful small-group travel experiences we’ve made famous with a little more polish. Start cruising and enjoy the romantic waves of Halong Bay with Annam Junk cruise. Explore & overnight in your own private cozy luxury cabin with a fascinating and breathtaking peaceful view on this unique UNESCO World Heritage Site, surrounded with thousands of limestone karsts and isles in various shapes and sizes. We know our stuff over the years and we don’t mince our words. And if a cruise in Halong Bay isn’t up to scratch you won’t find it on our selections list, you're just going to have to join us & enjoy! Are you ready for a unique & unforgettable experience and memories you will treasure forever? OUR PRICING 2018 Cruise Cabin Cabin setup Cabin price Price for Price per pax - Deluxe Double Double/twin bed 276 $USD 2 pax 138 $USD - Deluxe Single Single bed 169 $USD 1 pax 169 $USD - Premium Double Double/twin bed 306 $USD 2 pax 153 $USD - Premium Single Single bed 185 $USD 1 pax 185 $USD - Suite Double Double/twin bed 320 $USD 2 pax 160 $USD - Suite Single Single bed 193 $USD 1 pax 193 $USD - Royal Double Double/twin bed 340 $USD 2 pax 170 $USD - Royal Single Single bed 203 $USD 1 pax 203 $USD * As we would like to surprise you about our quality & services all our tour prices are included as mentioned in our itinerary. Our pricing is only applicable as individual or group bookings as mentioned in our price table, in general you only need some pocket money for your personal expenses as for your drinks. CHECK OUR LATEST PROMOTIONS & OFFERS: Last Minute Deals | Happy Birthday Discounts | Promotions Friends Travel Vietnam offer discounts for groups of 4 or more, we encourage groups to book with us by offering discounts for group bookings. For detailed information for bigger groups, prices and tickets, please contact us! FRIENDS TRAVEL VIETNAM’S LOUNGE WAITING AREA & SERVICES As special privilege for our clients Friends Travel Vietnam has his own private Lounge waiting area at our Office in Hanoi, just for your convenience to relax or to get refreshed. Free services: Breakfast service, drinks, shower service, internet, computer & print service, lounge coaches/beds, secure lugage storage room, Hanoi City map, trekking shoes & gear Extra Services: Laundry service. AIRPORT PICK UP & DROP OFF SERVICE Friends Travel Vietnam offers wide range of transportation services for all over Vietnam especially car rental service with private driver & Airport Transfer Services. We specially take care from your moment of arrival until leaving. We pay attention to detail & understand your expectation. We do not simply provide transportation services, we aim to be your travelling companion. More info or book directly airport transportation click here... IMPORTANT TO KNOW ABOUT HALONG BAY BEFORE YOU BOOK WITH US Please note that Friends Travel Vietnam, tries at all time to give an accurate illustration of the proposed itinerary for 2 days & 1 night on Halong Bay. This is our strenght to be open and honest and to be clear in information to our clients with our reputation during the time we operate, you are traveling to most popular touristic destination in Vietnam. Our intensions are not to create over expectation of your trip, that’s why we would like to share joining a trip like this give you a great experience and a caught a glimpse of breathtaking Halong Bay. But we would like to highlight that Halong Bay will be popular touristic destination as doing the activities and visiting the caves or islands during day 1 and 2, if your schedule allow we advise you to join the option for 3 days & 2 nights on Halong Bay this all for a more better holiday experience, where on the 2nd day you will discover Halong Bay on a non-less-touristic way on a smaller cruise cruising around, to incorporate experience from past travellers' comments and our own research. We just want you in the right mindset before booking & visiting breathtaking Halong Bay. CANCELATION POLICY FOR HALONG BAY CRUISE BOOKINGS - More than 30 days prior to check-in: free of charge - From 30 to 7 days prior to check-in: 10% of total rates - From 6 to 3 days prior to check in: 50% of total rates. - Less than 3 days prior to check-in: 100% of total rates. - No-Show: 100% of total rates. Cancellation notice must be send to us via email. Refunds will be processed in between 48 hours or directly at our office during openings hours. CANCELLATION DECISION MADE BY MANAGEMENT BOARD OF HALONG BAY When cancellation decision are made by Management Board of Halong Bay on the day of the trip in case of bad weather conditions or other safety matters. In such case, we will make alternative travel arrangement for you on request or offer refund in accordance with the cruise policy on the non joined services following your itinerary. Refunds will be processed directly at our office during openings hours. ITINERARY DISCLAIMER This information has been compiled with care and good faith. They give an accurate illustration of the proposed arrangements for this holiday. Occasionally our itineraries are updated during the year to incorporate improvements stemming from past travellers' comments and our own research. The information given in your itinerary may be slightly different on the day of your departure. It's very important that you print and review a final copy of your Itinerary & Trip Notes a couple of days prior to travel, in case there have been changes that affect your plans, we always handover before your departure our latest updated itinerary. If you have any queries, please contact us directly we are here to help you! While we operate successful different options for our “Halong Bay Cruise” trips in this region throughout the year, some changes may occur in our itineraries. Circumstances beyond our control such as changes in local conditions, inclement weather to timetables and transport routes or other reasons could force us to make changes to this itinerary. Any costs shown are subject to change, though are an accurate reflection of costs at time of writing. This can happen with little notice so please be prepared for modifications to the route. The order and timing of included activities in each location may also vary from time to time. Please also note that visa requirements are subject to change and are the responsibility of the traveller and not that of Friends Travel Vietnam. PAYMENT INSTRUCTIONS To secure your booking, you have settled your down-payment with us. The balance due is payable upon your arrival in Hanoi at Friends Travel Vietnam office at 62 Hang Buom street, on the day before your scheduled departure. It’s possible to settle by cash or credit card (settle by card there might be an applicable transaction fee). Be aware that our prices are not inclusive of transfer fees levied by your bank and oversea bank - please ask your bank to transfer the sum prior deduction or any shortfall. The booking is only confirmed when full payment is completed on at least a day before your departure or if agreed others by email. We reserve the right to release part or full booking if the full payment is not completed as deadline. Payment in Vietnam Dong is to be made equivalent to the amount in United States Dollars at the official exchange rate of the VietcomBank at the time of your booking. TRIP NOTES We recommend that you take a moment to read through this information before travelling, and would appreciate any feedback on how well it's being implemented in the field. 2 days & 1 night at Halong Bay starts from 144$ | only 72$ per day - per person All Incl: Private Cabin + Guide + Meals + Fees + Kayaking + Tai Chi Session & more... Friends Travel Vietnam’s - premium selected cruise trips combine the meaningful small-group travel experiences we’ve made famous with a little more polish. Start cruising and enjoy the romantic waves of Halong Bay with Garden Bay cruise. Explore & overnight in your own private cozy luxury cabin with a fascinating and breathtaking peaceful view on this unique UNESCO World Heritage Site, surrounded with thousands of limestone karsts and isles in various shapes and sizes. We know our stuff over the years and we don’t mince our words. And if a cruise in Halong Bay isn’t up to scratch you won’t find it on our selections list, you're just going to have to join us & enjoy! Are you ready for a unique & unforgettable experience and memories you will treasure forever? OUR PRICING * LOW Season period: from 01/05/2019 - 30/09/2019 Cruise Cabin Cabin setup Cabin price Price for Price per pax - Deluxe Double Double/twin bed 296 $USD 2 pax 148 $USD - Deluxe Single Single bed 187 $USD 1 pax 187 $USD - Balcony Double Double/twin bed 324 $USD 2 pax 162 $USD - Balcony Single Single bed 202 $USD 1 pax 202 $USD - Balcony Suite Double/twin bed 344 $USD 2 pax 172 $USD - Balcony Suite Single Single bed 207 $USD 1 pax 207 $USD - Balcony Suite Triple Double/twin bed + Extra bed 486 $USD 3 pax 162 $USD * HIGH Season period: from 01/01/2019 - 30/04/2019 AND 01/10/2019 - 31/12/2019 Cruise Cabin Cabin setup Cabin price Price for Price per pax - Deluxe Double Double/twin bed 296 $USD 2 pax 148 $USD - Deluxe Single Single bed 187 $USD 1 pax 187 $USD - Balcony Double Double/twin bed 324 $USD 2 pax 162 $USD - Balcony Single Single bed 202 $USD 1 pax 202 $USD - Balcony Suite Double/twin bed 344 $USD 2 pax 172 $USD - Balcony Suite Single Single bed 207 $USD 1 pax 207 $USD - Balcony Suite Triple Double/twin bed + Extra bed 486 $USD 3 pax 162 $USD * As we would like to surprise you about our quality & services all our tour prices are included as mentioned in our itinerary. Our pricing is only applicable as individual or group bookings as mentioned in our price table, in general you only need some pocket money for your personal expenses as for your drinks. CHECK OUR LATEST PROMOTIONS & OFFERS: Last Minute Deals | Happy Birthday Discounts | Promotions Friends Travel Vietnam offer discounts for groups of 4 or more, we encourage groups to book with us by offering discounts for group bookings. For detailed information for bigger groups, prices and tickets, please contact us! FRIENDS TRAVEL VIETNAM’S LOUNGE WAITING AREA & SERVICES As special privilege for our clients Friends Travel Vietnam has his own private Lounge waiting area at our Office in Hanoi, just for your convenience to relax or to get refreshed. Free services: Breakfast service, drinks, shower service, internet, computer & print service, lounge coaches/beds, secure lugage storage room, Hanoi City map, trekking shoes & gear Extra Services: Laundry service. AIRPORT PICK UP & DROP OFF SERVICE Friends Travel Vietnam offers wide range of transportation services for all over Vietnam especially car rental service with private driver & Airport Transfer Services. We specially take care from your moment of arrival until leaving. We pay attention to detail & understand your expectation. We do not simply provide transportation services, we aim to be your travelling companion. More info or book directly airport transportation click here... IMPORTANT TO KNOW ABOUT HALONG BAY BEFORE YOU BOOK WITH US Please note that Friends Travel Vietnam, tries at all time to give an accurate illustration of the proposed itinerary for 2 days & 1 night on Halong Bay. This is our strenght to be open and honest and to be clear in information to our clients with our reputation during the time we operate, you are traveling to most popular touristic destination in Vietnam. Our intensions are not to create over expectation of your trip, that’s why we would like to share joining a trip like this give you a great experience and a caught a glimpse of breathtaking Halong Bay. But we would like to highlight that Halong Bay will be popular touristic destination as doing the activities and visiting the caves or islands during day 1 and 2, if your schedule allow we advise you to join the option for 3 days & 2 nights on Halong Bay this all for a more better holiday experience, where on the 2nd day you will discover Halong Bay on a non-less-touristic way on a smaller cruise cruising around, to incorporate experience from past travellers' comments and our own research. We just want you in the right mindset before booking & visiting breathtaking Halong Bay. Check Now | 3 days & 2 nights option for a better Cruise experience in Halong Bay CANCELATION POLICY FOR HALONG BAY CRUISE BOOKINGS - More than 30 days prior to check-in: free of charge - From 30 to 7 days prior to check-in: 10% of total rates - From 6 to 3 days prior to check in: 50% of total rates. - Less than 3 days prior to check-in: 100% of total rates. - No-Show: 100% of total rates. Cancellation notice must be send to us via email. Refunds will be processed in between 48 hours or directly at our office during openings hours. CANCELLATION DECISION MADE BY MANAGEMENT BOARD OF HALONG BAY When cancellation decision are made by Management Board of Halong Bay on the day of the trip in case of bad weather conditions or other safety matters. In such case, we will make alternative travel arrangement for you on request or offer refund in accordance with the cruise policy on the non joined services following your itinerary. Refunds will be processed directly at our office during openings hours. ITINERARY DISCLAIMER This information has been compiled with care and good faith. They give an accurate illustration of the proposed arrangements for this holiday. Occasionally our itineraries are updated during the year to incorporate improvements stemming from past travellers' comments and our own research. The information given in your itinerary may be slightly different on the day of your departure. It's very important that you print and review a final copy of your Itinerary & Trip Notes a couple of days prior to travel, in case there have been changes that affect your plans, we always handover before your departure our latest updated itinerary. If you have any queries, please contact us directly we are here to help you! While we operate successful different options for our “Halong Bay Cruise” trips in this region throughout the year, some changes may occur in our itineraries. Circumstances beyond our control such as changes in local conditions, inclement weather to timetables and transport routes or other reasons could force us to make changes to this itinerary. Any costs shown are subject to change, though are an accurate reflection of costs at time of writing. This can happen with little notice so please be prepared for modifications to the route. The order and timing of included activities in each location may also vary from time to time. Please also note that visa requirements are subject to change and are the responsibility of the traveller and not that of Friends Travel Vietnam. PAYMENT INSTRUCTIONS To secure your booking, you have settled your down-payment with us. The balance due is payable upon your arrival in Hanoi at Friends Travel Vietnam office at 62 Hang Buom street, on the day before your scheduled departure. It’s possible to settle by cash or credit card (settle by card there might be an applicable transaction fee). Be aware that our prices are not inclusive of transfer fees levied by your bank and oversea bank - please ask your bank to transfer the sum prior deduction or any shortfall. The booking is only confirmed when full payment is completed on at least a day before your departure or if agreed others by email. We reserve the right to release part or full booking if the full payment is not completed as deadline. Payment in Vietnam Dong is to be made equivalent to the amount in United States Dollars at the official exchange rate of the VietcomBank at the time of your booking. TRIP NOTES We recommend that you take a moment to read through this information before travelling, and would appreciate any feedback on how well it's being implemented in the field. 2 days & 1 night at Halong Bay starts from 176$ | only 88$ per day - per person All Incl: Private Cabin + Guide + Meals + Fees + Kayaking + Tai Chi Session & more... Friends Travel Vietnam’s - premium selected cruise trips combine the meaningful small-group travel experiences we’ve made famous with a little more polish. 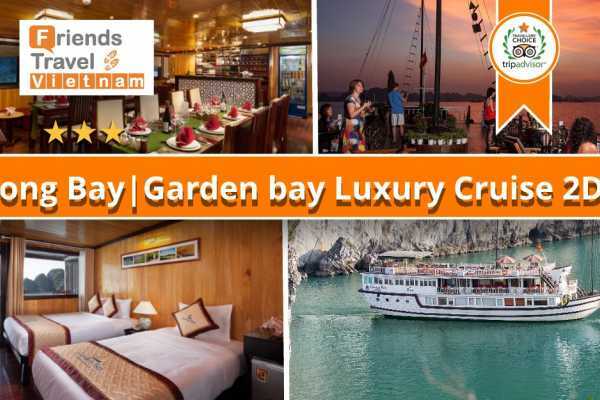 Start cruising and enjoy the romantic waves of Halong Bay with Garden Bay cruise. Explore & overnight in your own private cozy luxury cabin with a fascinating and breathtaking peaceful view on this unique UNESCO World Heritage Site, surrounded with thousands of limestone karsts and isles in various shapes and sizes. We know our stuff over the years and we don’t mince our words. And if a cruise in Halong Bay isn’t up to scratch you won’t find it on our selections list, you're just going to have to join us & enjoy! Are you ready for a unique & unforgettable experience and memories you will treasure forever? OUR PRICING 2019 Cruise Cabin Cabin setup Cabin price Price for Price per pax - Deluxe Seaview Double Double/twin bed 352 $USD 2 pax 150 $USD - Deluxe Seaview Single Single bed 256 $USD 1 pax 200 $USD - Deluxe Seaview Triple Double/twin bed + Extra bed 492 $USD 3 pax 140 $USD - Premium Deluxe Bay - View Double Double/twin bed 372 $USD 2 pax 160 $USD - Premium Deluxe Bay - View Single Single bed 266 $USD 1 pax 210 $USD - VIP Deluxe Double/twin bed 392 $USD 2 pax 176 $USD - VIP Deluxe Single Single bed 286 $USD 1 pax 230 $USD - Family Connecting - door for 2 pax Double/twin bed 512 $USD 2 pax 256 $USD - Family Connecting - door for 3 pax Double/twin bed + Extra bed 603 $USD 3 pax 201 $USD - Family Connecting - door for 4 pax Double/twin bed + Double/twin bed 704 $USD 4 pax 156 $USD * As we would like to surprise you about our quality & services all our tour prices are included as mentioned in our itinerary. Our pricing is only applicable as individual or group bookings as mentioned in our price table, in general you only need some pocket money for your personal expenses as for your drinks. CHECK OUR LATEST PROMOTIONS & OFFERS: Last Minute Deals | Happy Birthday Discounts | Promotions Friends Travel Vietnam offer discounts for groups of 4 or more, we encourage groups to book with us by offering discounts for group bookings. For detailed information for bigger groups, prices and tickets, please contact us! IMPORTANT TO KNOW ABOUT HALONG BAY BEFORE YOU BOOK WITH US Please note that Friends Travel Vietnam, tries at all time to give an accurate illustration of the proposed itinerary for 2 days & 1 night on Halong Bay. This is our strenght to be open and honest and to be clear in information to our clients with our reputation during the time we operate, you are traveling to most popular touristic destination in Vietnam. Our intensions are not to create over expectation of your trip, that’s why we would like to share joining a trip like this give you a great experience and a caught a glimpse of breathtaking Halong Bay. But we would like to highlight that Halong Bay will be popular touristic destination as doing the activities and visiting the caves or islands during day 1 and 2, if your schedule allow we advise you to join the option for 3 days & 2 nights on Halong Bay this all for a more better holiday experience, where on the 2nd day you will discover Halong Bay on a non-less-touristic way on a smaller cruise cruising around, to incorporate experience from past travellers' comments and our own research. We just want you in the right mindset before booking & visiting breathtaking Halong Bay. Check Now | 3 days & 2 nights option for a better Cruise experience in Halong Bay CANCELATION POLICY FOR HALONG BAY CRUISE BOOKINGS - More than 30 days prior to check-in: free of charge - From 30 to 7 days prior to check-in: 10% of total rates - From 6 to 3 days prior to check in: 50% of total rates. - Less than 3 days prior to check-in: 100% of total rates. - No-Show: 100% of total rates. Cancellation notice must be send to us via email. Refunds will be processed in between 48 hours or directly at our office during openings hours. CANCELLATION DECISION MADE BY MANAGEMENT BOARD OF HALONG BAY When cancellation decision are made by Management Board of Halong Bay on the day of the trip in case of bad weather conditions or other safety matters. In such case, we will make alternative travel arrangement for you on request or offer refund in accordance with the cruise policy on the non joined services following your itinerary. Refunds will be processed directly at our office during openings hours. ITINERARY DISCLAIMER This information has been compiled with care and good faith. They give an accurate illustration of the proposed arrangements for this holiday. Occasionally our itineraries are updated during the year to incorporate improvements stemming from past travellers' comments and our own research. The information given in your itinerary may be slightly different on the day of your departure. It's very important that you print and review a final copy of your Itinerary & Trip Notes a couple of days prior to travel, in case there have been changes that affect your plans, we always handover before your departure our latest updated itinerary. If you have any queries, please contact us directly we are here to help you! While we operate successful different options for our “Halong Bay Cruise” trips in this region throughout the year, some changes may occur in our itineraries. Circumstances beyond our control such as changes in local conditions, inclement weather to timetables and transport routes or other reasons could force us to make changes to this itinerary. Any costs shown are subject to change, though are an accurate reflection of costs at time of writing. This can happen with little notice so please be prepared for modifications to the route. The order and timing of included activities in each location may also vary from time to time. Please also note that visa requirements are subject to change and are the responsibility of the traveller and not that of Friends Travel Vietnam. PAYMENT INSTRUCTIONS To secure your booking, you have settled your down-payment with us. The balance due is payable upon your arrival in Hanoi at Friends Travel Vietnam office at 62 Hang Buom street, on the day before your scheduled departure. It’s possible to settle by cash or credit card (settle by card there might be an applicable transaction fee). Be aware that our prices are not inclusive of transfer fees levied by your bank and oversea bank - please ask your bank to transfer the sum prior deduction or any shortfall. The booking is only confirmed when full payment is completed on at least a day before your departure or if agreed others by email. We reserve the right to release part or full booking if the full payment is not completed as deadline. Payment in Vietnam Dong is to be made equivalent to the amount in United States Dollars at the official exchange rate of the VietcomBank at the time of your booking. TRIP NOTES We recommend that you take a moment to read through this information before travelling, and would appreciate any feedback on how well it's being implemented in the field. 3 days & 2nights at Halong Bay starts from 220$ | only 73$ per day - per person All Incl: Private Cabin + Guide + Meals + Fees + Kayaking + Tai Chi Session & more... Friends Travel Vietnam’s - premium selected cruise trips combine the meaningful small-group travel experiences we’ve made famous with a little more polish. 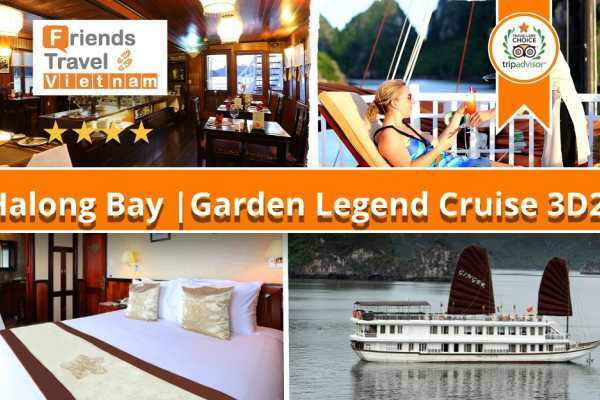 Start cruising and enjoy the romantic waves of Halong Bay with Garden Legend cruise. Explore & overnight in your own private cozy luxury cabin with a fascinating and breathtaking peaceful view on this unique UNESCO World Heritage Site, surrounded with thousands of limestone karsts and isles in various shapes and sizes. We know our stuff over the years and we don’t mince our words. And if a cruise in Halong Bay isn’t up to scratch you won’t find it on our selections list, you're just going to have to join us & enjoy! Are you ready for a unique & unforgettable experience and memories you will treasure forever? OUR PRICING: 2019 Cruise Cabin Cabin setup Cabin price Price for Price per pax - Deluxe Seaview Double Double/twin bed 440 $USD 2 pax 220 $USD - Deluxe Seaview Single Single bed 316 $USD 1 pax 316 $USD - Deluxe Seaview Triple Double/twin bed + Extra bed 600 $USD 3 pax 200 $USD - Premium Deluxe Bay - View Double Double/twin bed 480 $USD 2 pax 240 $USD - Premium Deluxe Bay - View Single Single bed 336 $USD 1 pax 336 $USD - VIP Deluxe Double/twin bed 500 $USD 2 pax 250 $USD - VIP Deluxe Single Single bed 376 USD 1 pax 376 $USD - Family Connecting for 04 pax Double bed + Twin bed 920 USD 4 pax 230 $USD * As we would like to surprise you about our quality & services all our tour prices are included as mentioned in our itinerary. Our pricing is only applicable as individual or group bookings as mentioned in our price table, in general you only need some pocket money for your personal expenses as for your drinks. CHECK OUR LATEST PROMOTIONS & OFFERS: Last Minute Deals | Happy Birthday Discounts | Promotions Friends Travel Vietnam offer discounts for groups of 4 or more, we encourage groups to book with us by offering discounts for group bookings. For detailed information for bigger groups, prices and tickets, please contact us! FREE & EXCLUSIVE OFFERS We have selected free exclusive offers, you may be interested in one of the following free or exclusive services, we offer exclusively for guests who booking with us this cruise service. Check here your Free & Exclusive Offers ! FRIENDS TRAVEL VIETNAM’S LOUNGE WAITING AREA As special privilege for our clients Friends Travel Vietnam has his own private Lounge waiting area at our Office in Hanoi, just for your convenience to relax or to get refreshed. Free services: Drinks, shower service, internet, computer & print service, lounge coaches, storage room Extra Services: Laundry service. AIRPORT PICK UP & DROP OFF SERVICE Friends Travel Vietnam offers wide range of transportation services for all over Vietnam especially car rental service with private driver & Airport Transfer Services. We specially take care from your moment of arrival until leaving. We pay attention to detail & understand your expectation. We do not simply provide transportation services, we aim to be your travelling companion. More info or book directly airport transportation click here... IMPORTANT TO KNOW ABOUT HALONG BAY BEFORE YOU BOOK WITH US Please note that Friends Travel Vietnam, tries at all time to give an accurate illustration of the proposed itinerary for 2 days & 1 night on Halong Bay. This is our strenght to be open and honest and to be clear in information to our clients with our reputation during the time we operate, you are traveling to most popular touristic destination in Vietnam. Our intensions are not to create over expectation of your trip, that’s why we would like to share joining a trip like this give you a great experience and a caught a glimpse of breathtaking Halong Bay. But we would like to highlight that Halong Bay will be popular touristic destination as doing the activities and visiting the caves or islands during day 1 and 2, if your schedule allow we advise you to join the option for 3 days & 2 nights on Halong Bay this all for a more better holiday experience, where on the 2nd day you will discover Halong Bay on a non-less-touristic way on a smaller cruise cruising around, to incorporate experience from past travellers' comments and our own research. We just want you in the right mindset before booking & visiting breathtaking Halong Bay. Check Now | 3 days & 2 nights option for a better Cruise experience in Halong Bay CANCELATION POLICY FOR HALONG BAY CRUISE BOOKINGS - More than 30 days prior to check-in: free of charge - From 30 to 7 days prior to check-in: 10% of total rates - From 6 to 3 days prior to check in: 50% of total rates. - Less than 3 days prior to check-in: 100% of total rates. - No-Show: 100% of total rates. Cancellation notice must be send to us via email. Refunds will be processed in between 48 hours or directly at our office during openings hours. CANCELLATION DECISION MADE BY MANAGEMENT BOARD OF HALONG BAY When cancellation decision are made by Management Board of Halong Bay on the day of the trip in case of bad weather conditions or other safety matters. In such case, we will make alternative travel arrangement for you on request or offer refund in accordance with the cruise policy on the non joined services following your itinerary. Refunds will be processed directly at our office during openings hours. ITINERARY DISCLAIMER This information has been compiled with care and good faith. They give an accurate illustration of the proposed arrangements for this holiday. Occasionally our itineraries are updated during the year to incorporate improvements stemming from past travellers' comments and our own research. The information given in your itinerary may be slightly different on the day of your departure. It's very important that you print and review a final copy of your Itinerary & Trip Notes a couple of days prior to travel, in case there have been changes that affect your plans, we always handover before your departure our latest updated itinerary. If you have any queries, please contact us directly we are here to help you! While we operate successful different options for our “Halong Bay Cruise” trips in this region throughout the year, some changes may occur in our itineraries. Circumstances beyond our control such as changes in local conditions, inclement weather to timetables and transport routes or other reasons could force us to make changes to this itinerary. Any costs shown are subject to change, though are an accurate reflection of costs at time of writing. This can happen with little notice so please be prepared for modifications to the route. The order and timing of included activities in each location may also vary from time to time. Please also note that visa requirements are subject to change and are the responsibility of the traveller and not that of Friends Travel Vietnam. PAYMENT INSTRUCTIONS To secure your booking, you have settled your down-payment with us. The balance due is payable upon your arrival in Hanoi at Friends Travel Vietnam office at 62 Hang Buom street, on the day before your scheduled departure. It’s possible to settle by cash or credit card (settle by card there might be an applicable transaction fee). Be aware that our prices are not inclusive of transfer fees levied by your bank and oversea bank - please ask your bank to transfer the sum prior deduction or any shortfall. The booking is only confirmed when full payment is completed on at least a day before your departure or if agreed others by email. We reserve the right to release part or full booking if the full payment is not completed as deadline. Payment in Vietnam Dong is to be made equivalent to the amount in United States Dollars at the official exchange rate of the VietcomBank at the time of your booking. TRIP NOTES We recommend that you take a moment to read through this information before travelling, and would appreciate any feedback on how well it's being implemented in the field. 2 days & 1 night at Halong Bay starts from 139$ | only 65$ per day - per person All Incl: Private Cabin + Guide + Meals + Fees + Kayaking + Tai Chi Session & more... Friends Travel Vietnam’s - premium selected cruise trips to combine the meaningful small-group travel experiences we’ve made famous with a little more polish. Start cruising and enjoy the romantic waves of Halong Bay with Oriental cruise. Explore & overnight in your own private cozy luxury cabin with a fascinating and breathtaking peaceful view on this unique UNESCO World Heritage Site, surrounded with thousands of limestone karsts and isles in various shapes and sizes. We know our stuff over the years and we don’t mince our words. And if a cruise in Halong Bay isn’t up to scratch you won’t find it on our selections list, you're just going to have to join us & enjoy! Are you ready for a unique & unforgettable experience and memories you will treasure forever? OUR PRICING 2019 Cruise Cabin Cabin setup Cabin price Price for Price per pax - Superior Double Double/twin bed 278 $USD 2 pax 139 $USD - Superior Single Single bed 179 $USD 1 pax 179 $USD * As we would like to surprise you about our quality & services all our tour prices are included as mentioned in our itinerary. Our pricing is only applicable as individual or group bookings as mentioned in our price table, in general you only need some pocket money for your personal expenses as for your drinks. CHECK OUR LATEST PROMOTIONS & OFFERS: Last Minute Deals | Happy Birthday Discounts | Promotions Friends Travel Vietnam offer discounts for groups of 4 or more, we encourage groups to book with us by offering discounts for group bookings. For detailed information for bigger groups, prices and tickets, please contact us! FRIENDS TRAVEL VIETNAM’S LOUNGE WAITING AREA & SERVICES As special privilege for our clients Friends Travel Vietnam has his own private Lounge waiting area at our Office in Hanoi, just for your convenience to relax or to get refreshed. Free services: Breakfast service, drinks, shower service, internet, computer & print service, lounge coaches/beds, secure lugage storage room, Hanoi City map, trekking shoes & gear Extra Services: Laundry service. AIRPORT PICK UP & DROP OFF SERVICE Friends Travel Vietnam offers wide range of transportation services for all over Vietnam especially car rental service with private driver & Airport Transfer Services. We specially take care from your moment of arrival until leaving. We pay attention to detail & understand your expectation. We do not simply provide transportation services, we aim to be your travelling companion. More info or book directly airport transportation click here... IMPORTANT TO KNOW ABOUT HALONG BAY BEFORE YOU BOOK WITH US Please note that Friends Travel Vietnam, tries at all time to give an accurate illustration of the proposed itinerary for 2 days & 1 night on Halong Bay. This is our strenght to be open and honest and to be clear in information to our clients with our reputation during the time we operate, you are traveling to most popular touristic destination in Vietnam. Our intensions are not to create over expectation of your trip, that’s why we would like to share joining a trip like this give you a great experience and a caught a glimpse of breathtaking Halong Bay. But we would like to highlight that Halong Bay will be popular touristic destination as doing the activities and visiting the caves or islands during day 1 and 2, if your schedule allow we advise you to join the option for 3 days & 2 nights on Halong Bay this all for a more better holiday experience, where on the 2nd day you will discover Halong Bay on a non-less-touristic way on a smaller cruise cruising around, to incorporate experience from past travellers' comments and our own research. We just want you in the right mindset before booking & visiting breathtaking Halong Bay. Check Now | 3 days & 2 nights option for a better Cruise experience in Halong Bay CANCELATION POLICY FOR HALONG BAY CRUISE BOOKINGS - More than 30 days prior to check-in: free of charge - From 30 to 7 days prior to check-in: 10% of total rates - From 6 to 3 days prior to check in: 50% of total rates. - Less than 3 days prior to check-in: 100% of total rates. - No-Show: 100% of total rates. Cancellation notice must be send to us via email. Refunds will be processed in between 48 hours or directly at our office during openings hours. CANCELLATION DECISION MADE BY MANAGEMENT BOARD OF HALONG BAY When cancellation decision are made by Management Board of Halong Bay on the day of the trip in case of bad weather conditions or other safety matters. In such case, we will make alternative travel arrangement for you on request or offer refund in accordance with the cruise policy on the non joined services following your itinerary. Refunds will be processed directly at our office during openings hours. ITINERARY DISCLAIMER This information has been compiled with care and good faith. They give an accurate illustration of the proposed arrangements for this holiday. Occasionally our itineraries are updated during the year to incorporate improvements stemming from past travellers' comments and our own research. The information given in your itinerary may be slightly different on the day of your departure. It's very important that you print and review a final copy of your Itinerary & Trip Notes a couple of days prior to travel, in case there have been changes that affect your plans, we always handover before your departure our latest updated itinerary. If you have any queries, please contact us directly we are here to help you! While we operate successful different options for our “Halong Bay Cruise” trips in this region throughout the year, some changes may occur in our itineraries. Circumstances beyond our control such as changes in local conditions, inclement weather to timetables and transport routes or other reasons could force us to make changes to this itinerary. Any costs shown are subject to change, though are an accurate reflection of costs at time of writing. This can happen with little notice so please be prepared for modifications to the route. The order and timing of included activities in each location may also vary from time to time. Please also note that visa requirements are subject to change and are the responsibility of the traveller and not that of Friends Travel Vietnam. PAYMENT INSTRUCTIONS To secure your booking, you have settled your down-payment with us. The balance due is payable upon your arrival in Hanoi at Friends Travel Vietnam office at 62 Hang Buom street, on the day before your scheduled departure. It’s possible to settle by cash or credit card (settle by card there might be an applicable transaction fee). Be aware that our prices are not inclusive of transfer fees levied by your bank and oversea bank - please ask your bank to transfer the sum prior deduction or any shortfall. The booking is only confirmed when full payment is completed on at least a day before your departure or if agreed others by email. We reserve the right to release part or full booking if the full payment is not completed as deadline. Payment in Vietnam Dong is to be made equivalent to the amount in United States Dollars at the official exchange rate of the VietcomBank at the time of your booking. TRIP NOTES We recommend that you take a moment to read through this information before travelling, and would appreciate any feedback on how well it's being implemented in the field. 3 days & 2 nights at Halong Bay starts from 239 $ | only 80 $ per day - per person All Incl: Private Cabin + Guide + Meals + Fees + Kayaking + Tai Chi Session & more... Friends Travel Vietnam’s - premium selected cruise trips combine the meaningful small-group travel experiences we’ve made famous with a little more polish. Start cruising and enjoy the romantic waves of Halong Bay with Oriental Cruise. Explore & overnight in your own private cozy luxury cabin with a fascinating and breathtaking peaceful view on this unique UNESCO World Heritage Site, surrounded with thousands of limestone karsts and isles in various shapes and sizes. We know our stuff over the years and we don’t mince our words. And if a cruise in Halong Bay isn’t up to scratch you won’t find it on our selections list, you're just going to have to join us & enjoy! Are you ready for a unique & unforgettable experience and memories you will treasure forever? OUR PRICING 2018-2019 Cruise Cabin Cabin setup Cabin price Price for Price per pax - Superior Double Double/twin bed 478 $USD 2 pax 240 $USD - Superior Single Single bed 349 $USD 1 pax 320 $USD * As we would like to surprise you about our quality & services all our tour prices are included as mentioned in our itinerary. Our pricing is only applicable as individual or group bookings as mentioned in our price table, in general you only need some pocket money for your personal expenses as for your drinks. CHECK OUR LATEST PROMOTIONS & OFFERS: Last Minute Deals | Free & Exclusive Offers | Happy Birthday Discounts | Early Bird Bookings Friends Travel Vietnam offer discounts for groups of 4 or more, we encourage groups to book with us by offering discounts for group bookings. Check now our Group Discounts Book more trips with us? Check our Multi Trip Discounts and save up to 15% For detailed information for bigger groups, prices and tickets, please contact us! FRIENDS TRAVEL VIETNAM’S LOUNGE WAITING AREA & SERVICES As special privilege for our clients Friends Travel Vietnam has his own private Lounge waiting area at our Office in Hanoi, just for your convenience to relax or to get refreshed. Free services: Breakfast service, drinks, shower service, internet, computer & print service, lounge coaches/beds, secure lugage storage room, Hanoi City map, trekking shoes & gear Extra Services: Laundry service. AIRPORT PICK UP & DROP OFF SERVICE Friends Travel Vietnam offers wide range of transportation services for all over Vietnam especially car rental service with private driver & Airport Transfer Services. We specially take care from your moment of arrival until leaving. We pay attention to detail & understand your expectation. We do not simply provide transportation services, we aim to be your travelling companion. More info or book directly airport transportation click here... IMPORTANT TO KNOW ABOUT HALONG BAY BEFORE YOU BOOK WITH US Please note that Friends Travel Vietnam, tries at all time to give an accurate illustration of the proposed itinerary for 2 days & 1 night on Halong Bay. This is our strenght to be open and honest and to be clear in information to our clients with our reputation during the time we operate, you are traveling to most popular touristic destination in Vietnam. Our intensions are not to create over expectation of your trip, that’s why we would like to share joining a trip like this give you a great experience and a caught a glimpse of breathtaking Halong Bay. But we would like to highlight that Halong Bay will be popular touristic destination as doing the activities and visiting the caves or islands during day 1 and 2, if your schedule allow we advise you to join the option for 3 days & 2 nights on Halong Bay this all for a more better holiday experience, where on the 2nd day you will discover Halong Bay on a non-less-touristic way on a smaller cruise cruising around, to incorporate experience from past travellers' comments and our own research. We just want you in the right mindset before booking & visiting breathtaking Halong Bay. Check also 2 days & 1 nights option for this Cruise experience in Halong Bay CANCELATION POLICY FOR HALONG BAY CRUISE BOOKINGS - More than 30 days prior to check-in: free of charge - From 30 to 7 days prior to check-in: 10% of total rates - From 6 to 3 days prior to check in: 50% of total rates. - Less than 3 days prior to check-in: 100% of total rates. - No-Show: 100% of total rates. Cancellation notice must be send to us via email. Refunds will be processed in between 48 hours or directly at our office during openings hours. CANCELLATION DECISION MADE BY MANAGEMENT BOARD OF HALONG BAY When cancellation decision are made by Management Board of Halong Bay on the day of the trip in case of bad weather conditions or other safety matters. In such case, we will make alternative travel arrangement for you on request or offer refund in accordance with the cruise policy on the non joined services following your itinerary. Refunds will be processed directly at our office during openings hours. ITINERARY DISCLAIMER This information has been compiled with care and good faith. They give an accurate illustration of the proposed arrangements for this holiday. Occasionally our itineraries are updated during the year to incorporate improvements stemming from past travellers' comments and our own research. The information given in your itinerary may be slightly different on the day of your departure. It's very important that you print and review a final copy of your Itinerary & Trip Notes a couple of days prior to travel, in case there have been changes that affect your plans, we always handover before your departure our latest updated itinerary. If you have any queries, please contact us directly we are here to help you! While we operate successful different options for our “Halong Bay Cruise” trips in this region throughout the year, some changes may occur in our itineraries. Circumstances beyond our control such as changes in local conditions, inclement weather to timetables and transport routes or other reasons could force us to make changes to this itinerary. Any costs shown are subject to change, though are an accurate reflection of costs at time of writing. This can happen with little notice so please be prepared for modifications to the route. The order and timing of included activities in each location may also vary from time to time. Please also note that visa requirements are subject to change and are the responsibility of the traveller and not that of Friends Travel Vietnam. PAYMENT INSTRUCTIONS To secure your booking, you have settled your down-payment with us. The balance due is payable upon your arrival in Hanoi at Friends Travel Vietnam office at 62 Hang Buom street, on the day before your scheduled departure. It’s possible to settle by cash or credit card (settle by card there might be an applicable transaction fee). Be aware that our prices are not inclusive of transfer fees levied by your bank and oversea bank - please ask your bank to transfer the sum prior deduction or any shortfall. The booking is only confirmed when full payment is completed on at least a day before your departure or if agreed others by email. We reserve the right to release part or full booking if the full payment is not completed as deadline. Payment in Vietnam Dong is to be made equivalent to the amount in United States Dollars at the official exchange rate of the VietcomBank at the time of your booking. TRIP NOTES We recommend that you take a moment to read through this information before travelling, and would appreciate any feedback on how well it's being implemented in the field. 2 days & 1 night at Halong Bay starts from $219 | $109 per day - per person All Incl: Private Cabin + Guide + Meals + Fees + Kayaking + Tai Chi Session & more... Friends Travel Vietnam’s - premium selected cruise trips combine the meaningful small-group travel experiences we’ve made famous with a little more polish. 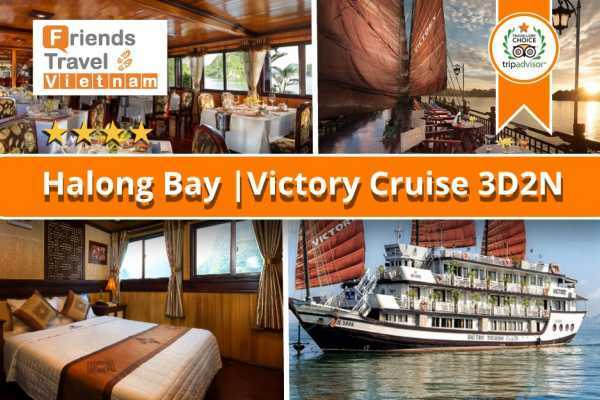 Start cruising and enjoy the romantic waves of Halong Bay with Victory Star cruise. Explore & overnight in your own private cozy luxury cabin with a fascinating and breathtaking peaceful view on this unique UNESCO World Heritage Site, surrounded with thousands of limestone karsts and isles in various shapes and sizes. We know our stuff over the years and we don’t mince our words. And if a cruise in Halong Bay isn’t up to scratch you won’t find it on our selections list, you're just going to have to join us & enjoy! Are you ready for a unique & unforgettable experience and memories you will treasure forever? CHECK OUR LATEST PROMOTIONS & OFFERS: Last Minute Deals | Happy Birthday Discounts | Promotions Friends Travel Vietnam offer discounts for groups of 4 or more, we encourage groups to book with us by offering discounts for group bookings. For detailed information for bigger groups, prices and tickets, please contact us! OUR PRICING High Season period: from 01/01/2019 - 30/04/2019 AND 01/10/2019 - 31/12/2019 Cruise Cabin Cabin setup Cabin price Price for Price per pax - Deluxe Double Double/twin bed 460 $USD 2 pax 230 $USD - Deluxe Single Single bed 320 $USD 1 pax 320 $USD - Deluxe Triple Double/twin bed + Extra bed 669 $USD 3 pax 223 $USD - Suite Double Double/twin bed 538 $USD 2 pax 269 $USD - Suite Single Single bed 395 $USD 1 pax 395 $USD - President Double Double/twin bed 640 $USD 2 pax 320 $USD - President Single Single bed 495 $USD 1 pax 495 $USD Low Season period: from 01/05/2019 - 30/09/2019 Cruise Cabin Cabin setup Cabin price Price for Price per pax - Deluxe Double Double/twin bed 438 $USD 2 pax 219 $USD - Deluxe Single Single bed 299 $USD 1 pax 299 $USD - Deluxe Triple Double/twin bed + Extra bed 636 $USD 3 pax 212 $USD - Suite Double Double/twin bed 506 $USD 2 pax 253 $USD - Suite Single Single bed 360 $USD 1 pax 360 $USD - President Double Double/twin bed 598 $USD 2 pax 299 $USD - President Single Single bed 458 $USD 1 pax 458 $USD * As we would like to surprise you about our quality & services all our tour prices are included as mentioned in our itinerary. Our pricing is only applicable as individual or group bookings as mentioned in our price table, in general you only need some pocket money for your personal expenses as for your drinks. CHECK OUR LATEST PROMOTIONS & OFFERS: Last Minute Deals | Free & Exclusive Offers | Happy Birthday Discounts | Early Bird Bookings Friends Travel Vietnam offer discounts for groups of 4 or more, we encourage groups to book with us by offering discounts for group bookings. Check now our Group Discounts Book more trips with us? Check our Multi Trip Discounts and save up to 15% For detailed information for bigger groups, prices and tickets, please contact us! FRIENDS TRAVEL VIETNAM’S LOUNGE WAITING AREA & SERVICES As special privilege for our clients Friends Travel Vietnam has his own private Lounge waiting area at our Office in Hanoi, just for your convenience to relax or to get refreshed. Free services: Breakfast service, drinks, shower service, internet, computer & print service, lounge coaches/beds, secure lugage storage room, Hanoi City map, trekking shoes & gear Extra Services: Laundry service. AIRPORT PICK UP & DROP OFF SERVICE Friends Travel Vietnam offers wide range of transportation services for all over Vietnam especially car rental service with private driver & Airport Transfer Services. We specially take care from your moment of arrival until leaving. We pay attention to detail & understand your expectation. We do not simply provide transportation services, we aim to be your travelling companion. More info or book directly airport transportation click here... IMPORTANT TO KNOW ABOUT HALONG BAY BEFORE YOU BOOK WITH US Please note that Friends Travel Vietnam, tries at all time to give an accurate illustration of the proposed itinerary for 2 days & 1 night on Halong Bay. This is our strenght to be open and honest and to be clear in information to our clients with our reputation during the time we operate, you are traveling to most popular touristic destination in Vietnam. Our intensions are not to create over expectation of your trip, that’s why we would like to share joining a trip like this give you a great experience and a caught a glimpse of breathtaking Halong Bay. But we would like to highlight that Halong Bay will be popular touristic destination as doing the activities and visiting the caves or islands during day 1 and 2, if your schedule allow we advise you to join the option for 3 days & 2 nights on Halong Bay this all for a more better holiday experience, where on the 2nd day you will discover Halong Bay on a non-less-touristic way on a smaller cruise cruising around, to incorporate experience from past travellers' comments and our own research. We just want you in the right mindset before booking & visiting breathtaking Halong Bay. Check Now | 3 days & 2 nights option for a better Cruise experience in Halong Bay CANCELATION POLICY FOR HALONG BAY CRUISE BOOKINGS - More than 30 days prior to check-in: free of charge - From 30 to 7 days prior to check-in: 10% of total rates - From 6 to 3 days prior to check in: 50% of total rates. - Less than 3 days prior to check-in: 100% of total rates. - No-Show: 100% of total rates. Cancellation notice must be send to us via email. Refunds will be processed in between 48 hours or directly at our office during openings hours. CANCELLATION DECISION MADE BY MANAGEMENT BOARD OF HALONG BAY When cancellation decision are made by Management Board of Halong Bay on the day of the trip in case of bad weather conditions or other safety matters. In such case, we will make alternative travel arrangement for you on request or offer refund in accordance with the cruise policy on the non joined services following your itinerary. Refunds will be processed directly at our office during openings hours. ITINERARY DISCLAIMER This information has been compiled with care and good faith. They give an accurate illustration of the proposed arrangements for this holiday. Occasionally our itineraries are updated during the year to incorporate improvements stemming from past travellers' comments and our own research. The information given in your itinerary may be slightly different on the day of your departure. It's very important that you print and review a final copy of your Itinerary & Trip Notes a couple of days prior to travel, in case there have been changes that affect your plans, we always handover before your departure our latest updated itinerary. If you have any queries, please contact us directly we are here to help you! While we operate successful different options for our “Halong Bay Cruise” trips in this region throughout the year, some changes may occur in our itineraries. Circumstances beyond our control such as changes in local conditions, inclement weather to timetables and transport routes or other reasons could force us to make changes to this itinerary. Any costs shown are subject to change, though are an accurate reflection of costs at time of writing. This can happen with little notice so please be prepared for modifications to the route. The order and timing of included activities in each location may also vary from time to time. Please also note that visa requirements are subject to change and are the responsibility of the traveller and not that of Friends Travel Vietnam. PAYMENT INSTRUCTIONS To secure your booking, you have settled your down-payment with us. The balance due is payable upon your arrival in Hanoi at Friends Travel Vietnam office at 62 Hang Buom street, on the day before your scheduled departure. It’s possible to settle by cash or credit card (settle by card there might be an applicable transaction fee). Be aware that our prices are not inclusive of transfer fees levied by your bank and oversea bank - please ask your bank to transfer the sum prior deduction or any shortfall. The booking is only confirmed when full payment is completed on at least a day before your departure or if agreed others by email. We reserve the right to release part or full booking if the full payment is not completed as deadline. Payment in Vietnam Dong is to be made equivalent to the amount in United States Dollars at the official exchange rate of the VietcomBank at the time of your booking. TRIP NOTES We recommend that you take a moment to read through this information before travelling, and would appreciate any feedback on how well it's being implemented in the field. 3 days & 2 nights at Halong Bay starts from 319 $ | 106 $ per day - per person All Incl: Private Cabin + Guide + Meals + Fees + Kayaking + Tai Chi Session & more... Friends Travel Vietnam’s - premium selected cruise trips combine the meaningful small-group travel experiences we’ve made famous with a little more polish. Start cruising and enjoy the romantic waves of Halong Bay with Victory Star cruise. Explore & overnight in your own private cozy luxury cabin with a fascinating and breathtaking peaceful view on this unique UNESCO World Heritage Site, surrounded with thousands of limestone karsts and isles in various shapes and sizes. We know our stuff over the years and we don’t mince our words. And if a cruise in Halong Bay isn’t up to scratch you won’t find it on our selections list, you're just going to have to join us & enjoy! Are you ready for a unique & unforgettable experience and memories you will treasure forever? OUR PRICING High Season period: from 01/01/2019 - 30/04/2019 AND 01/10/2019 - 31/12/209 Cruise Cabin Cabin setup Cabin price Price for Price per pax - Deluxe Double Double/twin bed 660 $USD 2 pax 330 $USD - Deluxe Single Single bed 515 $USD 1 pax 515 $USD - Deluxe Triple Double/twin bed + Extra bed 960 $USD 3 pax 320 $USD - Suite Double Double/twin bed 780 $USD 2 pax 390 $USD - Suite Single Single bed 614 $USD 1 pax 614 $USD - President Double Double/twin bed 986 $USD 2 pax 493 $USD - President Single Single bed 816 $USD 1 pax 816 $USD Low Season period: from 01/05/2019 till 30/09/2019 Cruise Cabin Cabin setup Cabin price Price for Price per pax - Deluxe Double Double/twin bed 620 $USD 2 pax 310 $USD - Deluxe Single Single bed 470 $USD 1 pax 470 $USD - Deluxe Triple Double/twin bed + Extra bed 897 $USD 3 pax 299 $USD - Suite Double Double/twin bed 724 $USD 2 pax 362 $USD - Suite Single Single bed 560 $USD 1 pax 560 $USD - President Double Double/twin bed 906 $USD 2 pax 453 $USD - President Single Single bed 745 $USD 1 pax 745 $USD * As we would like to surprise you about our quality & services all our tour prices are included as mentioned in our itinerary. Our pricing is only applicable as individual or group bookings as mentioned in our price table, in general you only need some pocket money for your personal expenses as for your drinks. CHECK OUR LATEST PROMOTIONS & OFFERS: Last Minute Deals | Happy Birthday Discounts | Promotions Friends Travel Vietnam offer discounts for groups of 4 or more, we encourage groups to book with us by offering discounts for group bookings. For detailed information for bigger groups, prices and tickets, please contact us! FRIENDS TRAVEL VIETNAM’S LOUNGE WAITING AREA & SERVICES As special privilege for our clients Friends Travel Vietnam has his own private Lounge waiting area at our Office in Hanoi, just for your convenience to relax or to get refreshed. Free services: Breakfast service, drinks, shower service, internet, computer & print service, lounge coaches/beds, secure lugage storage room, Hanoi City map, trekking shoes & gear Extra Services: Laundry service. AIRPORT PICK UP & DROP OFF SERVICE Friends Travel Vietnam offers wide range of transportation services for all over Vietnam especially car rental service with private driver & Airport Transfer Services. We specially take care from your moment of arrival until leaving. We pay attention to detail & understand your expectation. We do not simply provide transportation services, we aim to be your travelling companion. More info or book directly airport transportation click here... IMPORTANT TO KNOW ABOUT HALONG BAY BEFORE YOU BOOK WITH US Please note that Friends Travel Vietnam, tries at all time to give an accurate illustration of the proposed itinerary for 3 days & 2 nights on Halong Bay. This is our strenght to be open and honest and to be clear in information to our clients with our reputation during the time we operate, you are traveling to most popular touristic destination in Vietnam. Our intensions are not to create over expectation of your trip, that’s why we would like to share joining a trip like this give you a great experience and a caught a glimpse of breathtaking Halong Bay. But we would like to highlight that Halong Bay will be popular touristic destination as doing the activities and visiting the caves or islands during day 1 and 2, if your schedule allow we advise you to join the option for 3 days & 2 nights on Halong Bay this all for a more better holiday experience, where on the 2nd day you will discover Halong Bay on a non-less-touristic way on a smaller cruise cruising around, to incorporate experience from past travellers' comments and our own research. We just want you in the right mindset before booking & visiting breathtaking Halong Bay. 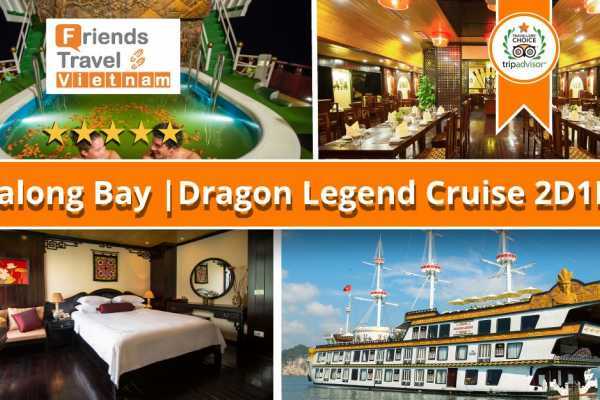 Check Now | 2 days & 1 night option for a better Cruise experience in Halong Bay CANCELATION POLICY FOR HALONG BAY CRUISE BOOKINGS - More than 30 days prior to check-in: free of charge - From 30 to 7 days prior to check-in: 10% of total rates - From 6 to 3 days prior to check in: 50% of total rates. - Less than 3 days prior to check-in: 100% of total rates. - No-Show: 100% of total rates. Cancellation notice must be send to us via email. Refunds will be processed in between 48 hours or directly at our office during openings hours. CANCELLATION DECISION MADE BY MANAGEMENT BOARD OF HALONG BAY When cancellation decision are made by Management Board of Halong Bay on the day of the trip in case of bad weather conditions or other safety matters. In such case, we will make alternative travel arrangement for you on request or offer refund in accordance with the cruise policy on the non joined services following your itinerary. Refunds will be processed directly at our office during openings hours. ITINERARY DISCLAIMER This information has been compiled with care and good faith. They give an accurate illustration of the proposed arrangements for this holiday. Occasionally our itineraries are updated during the year to incorporate improvements stemming from past travellers' comments and our own research. The information given in your itinerary may be slightly different on the day of your departure. It's very important that you print and review a final copy of your Itinerary & Trip Notes a couple of days prior to travel, in case there have been changes that affect your plans, we always handover before your departure our latest updated itinerary. If you have any queries, please contact us directly we are here to help you! While we operate successful different options for our “Halong Bay Cruise” trips in this region throughout the year, some changes may occur in our itineraries. Circumstances beyond our control such as changes in local conditions, inclement weather to timetables and transport routes or other reasons could force us to make changes to this itinerary. Any costs shown are subject to change, though are an accurate reflection of costs at time of writing. This can happen with little notice so please be prepared for modifications to the route. The order and timing of included activities in each location may also vary from time to time. Please also note that visa requirements are subject to change and are the responsibility of the traveller and not that of Friends Travel Vietnam. PAYMENT INSTRUCTIONS To secure your booking, you have settled your down-payment with us. The balance due is payable upon your arrival in Hanoi at Friends Travel Vietnam office at 62 Hang Buom street, on the day before your scheduled departure. It’s possible to settle by cash or credit card (settle by card there might be an applicable transaction fee). Be aware that our prices are not inclusive of transfer fees levied by your bank and oversea bank - please ask your bank to transfer the sum prior deduction or any shortfall. The booking is only confirmed when full payment is completed on at least a day before your departure or if agreed others by email. We reserve the right to release part or full booking if the full payment is not completed as deadline. Payment in Vietnam Dong is to be made equivalent to the amount in United States Dollars at the official exchange rate of the VietcomBank at the time of your booking. TRIP NOTES We recommend that you take a moment to read through this information before travelling, and would appreciate any feedback on how well it's being implemented in the field.